Ethereum smart contracts are computer programs that act only after specific conditions are met. Like a traditional contract, a smart contract defines the provisions and penalties around an agreement. Click to learn more! Ethereum didn’t invent the smart contract — Nick Szabo proposed the concept way back in 1995. But it's probably not overstating matters to say that Ethereum brought the smart contract to life. In fact, blockchain and smart contracts predate Ethereum, but in many ways Ethereum transformed both. Ethereum started with blockchains’ distributed ledger concept and built on it, dramatically expanding it to allow for more advanced commands than, say, Bitcoin. This creates the opportunity for all manner of potential applications. And although other blockchain platforms, including Bitcoin, can execute smart contracts, Ethereum was created specifically for that purpose. While Bitcoin is a peer-to-peer system used to track ownership of a digital currency, Ethereum is a peer-to-peer system used to keep track of changes to a decentralized database. This is what makes smart contracts possible. You probably know what a smart contract is, but let’s start at the beginning, anyway. Smart contracts are computer programs that act only after specific conditions are met. Put another way, it’s a protocol that executes the terms of a contract. Like a traditional contract, a smart contract defines the provisions and penalties around an agreement. Unlike traditional contracts, a smart contract automatically executes those obligations, often through an escrow-like account. Also unlike a traditional contract, once the terms of a smart contract are recorded on the blockchain, they cannot be altered. So what does this mean? 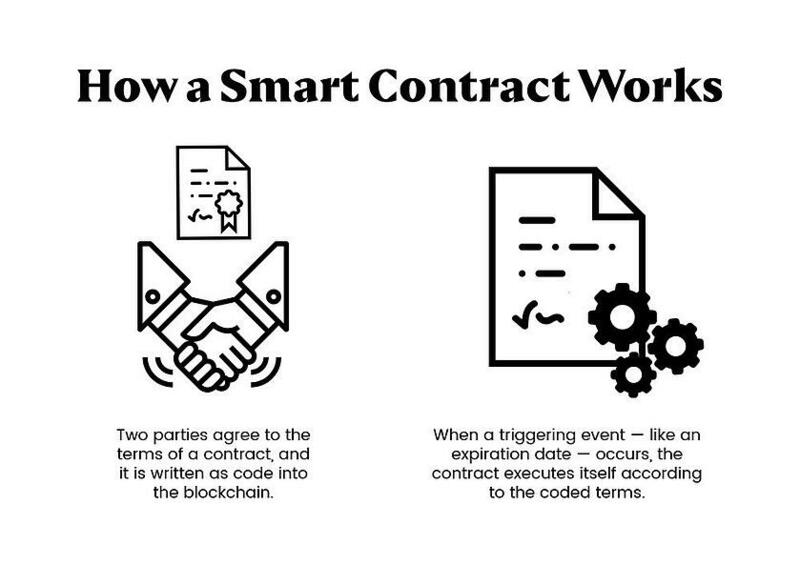 Smart contracts allow parties — who can remain anonymous — to enter into a binding, transparent agreement with each other. Value can be transferred between parties or held in escrow inside the smart contract itself. Now, let's go a little deeper. Ethereum lets developers program their own smart contracts to define EVM instructions. The EVM executes a contract according to the rules the developer programmed. Perhaps not surprisingly, online gaming offers an elegant example of how Ethereum smart contracts work in real life — and illustrates the crucial role of trust. Because smart contracts police themselves, they essentially create trust: A smart contract’s code is transparent and immutable. That covers the trust. The automated contract execution(if A, then B) also makes it attractive. Numerous Ethereum-based gaming sites are up and running, but there are plenty of other applications that deploy Ethereum smart contracts. Developers can use Ethereum to build decentralized apps (dApps) that take advantage of Ethereums’ smart contract technology. Most dApps are built on Ethereums’ blockchain. Non-financial applications, such as online voting and decentralized governance. Because Ethereum makes it possible to decentralize any service, the potential applications are almost endless; among them, insurance, retail, microfinance, gaming, virtual worlds, currency exchange, identity-theft protection, financial derivatives, breach contracts, property law, credit enforcement, financial services, legal processes, crowdfunding, voting systems, title registries, and thousands of others. Insurance. French insurance company AXA is testing fizzy, flight-delay insurance. Buy the insurance and if your flight is delayed by the agreed-upon amount of time, you get paid. Prediction markets. Gnosis and Augur are decentralized predictions platforms. Developers can create a prediction market for any event, such as the Super Bowl or an art auction. People can buy shares in an outcome, and the payout is automatic. Computer power. The Golem Project is a sharing economy — like Airbnb, but for computing power. Individuals can rent out their unused computing power, or they can buy more power from other users. Ethereum isn’t the only blockchain technology to support smart contracts. You can build smart contracts on Hyperledger Fabric using chaincode. We're quite not there yet, but things are moving rapidly. In December, the price of Ether topped $600 for the first time after the announcement that Swiss banking giant UBS would lead an Ethereum-based blockchain platform. “The news that Ethereum is being used as a base identity layer in conjunction with some of the larger banking giants out there is a positive ratification of the technology,” Charles Hayter, chief executive of digital currency comparison site Crypto Compare, told CNBC. But, beware of irrational exuberance. Issues abound, most notably, scalability. The problem itself is simple and, as the white paper alludes, it’s a blockchain issue, not merely an Ethereum one: Decentralization makes scalability a challenge. Each smart contract and transaction executed on the network must be processed across all the nodes. As if anyone needed a reminder, the Cryptokitties slowdown certainly highlighted the scalability issues. He announced that the Ethereum Foundation is redoubling its efforts and plans to collaborate with independent developers to improve Ethereums’ scalability. Speed and scalability aren’t the only issues. Remember, Ethereum smart contracts are still very young — and they are not yet legally binding. We don’t completely agree: It all depends on the use case. The challenge is knowing when it makes sense for your business and when it doesn’t. That same theory applies to selecting a blockchain platform. Ethereum may be a perfect fit for your organization, but perhaps Fabric is. Or maybe something else. No single blockchain will solve every problem: Different types of blockchains are better suited to different needs and circumstances. If you’re interested in learning more about other blockchain frameworks and platforms, you might like The Innovator's Guide to Picking the Right Blockchain.